Our Basic Chokers have five sections of 1 1/2" and 1" hairpipe. They are strung, each strand from end to end, on hand cut deerhide lace. 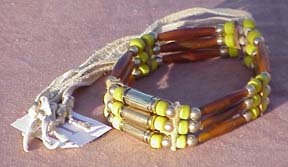 They come in 2-4 strand styles and can be made with horn: amber, black or red hairpipe. You may also select for us to include glass or brass beads only, or both for your Basic Choker order! Click on the Basic Choker pictures to see the full view! 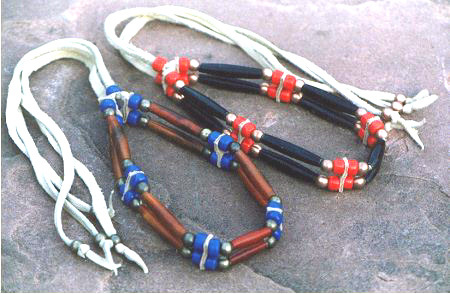 These pictures show chokers with both metal & glass beads! Our Battle Dress choker styles include: the Basic Choker shown above, and the Shell Casing Choker shown below. 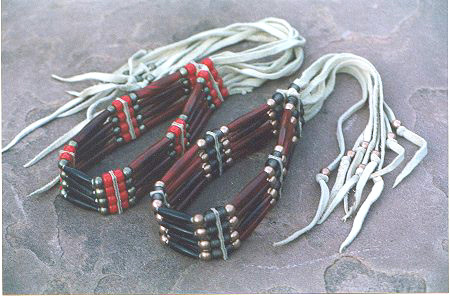 Our Shell Casing Chokers have sections of 1" & 1 1/2" hairpipe blended with 1, 2 or 3 sections of Pistol Shell casings. They are strung, each strand from end to end, on hand cut deerhide lace. They come in 2-4 strand styles and can be made with horn: amber, black or red hairpipe. You may also select for us to include glass or brass beads only, or both for your Shell Casing Choker order! 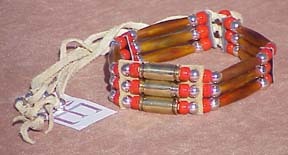 Shell Casing Chokers feature 1, 2 or 3 sections of pistol shell casings. Of course, the shell casing sections are backed with deerhide to prevent any irritating contact of the casing metal on the skin. Get your own Battle Dress Chokers at the same price or below the cost of others on the market!